Manhattan rolling steel doors are constructed of durable, secure steel and designed to give quick, easy access to buildings. These doors open by going up vertically, but gather into a roll at the top of the door instead of sliding along tracks. Whether applied in backyards, residences or industrial facilities, Manhattan rolling steel doors are a great asset for any structure that uses them. As you probably know, Manhattan rolling steel doors are the primary entry point for most self-storage units. But they are also are commonly used in shopping centers, recreation, agricultural and industrial facilities, as well as government, medical and business complexes. Here’s why Manhattan rolling steel doors are so popular. Less Money. In addition to generally being less expensive at initial purchase, Manhattan rolling steel doors save money over the course of their life-span. They last longer, require fewer, less expensive repairs, and are more durable and secure than products made from other materials. Doors made from steel are also more energy-efficient, saving on heating and electricity costs throughout the year. Security. As the most vulnerable points of most buildings, the security of steel roll-up doors is great for reducing the potential for damage and loss resulting from theft, fire, vandalism, excess noise and contamination. Steel doors that feature stainless steel latches are more impenetrable than those made from wood, fiberglass or aluminum and are better able to provide reliable security and peace-of-mind. Durability. Manufactured to protect against demanding environments and extreme weather, the resiliency of steel can resist the wear and tear of heavy traffic usage. Manhattan rolling steel doors can also be outfitted with rust-resistant components including spring coatings and bottom bars for added durability. Longevity. With proper installation and maintenance, metal doors can last 30 years or longer because they aren’t vulnerable to warping, rotting, denting or cracking like other materials are. The high-quality primers and paint coatings used on steel doors protect against chipping and scratching, keeping the doors looking better longer. Easy Maintenance. 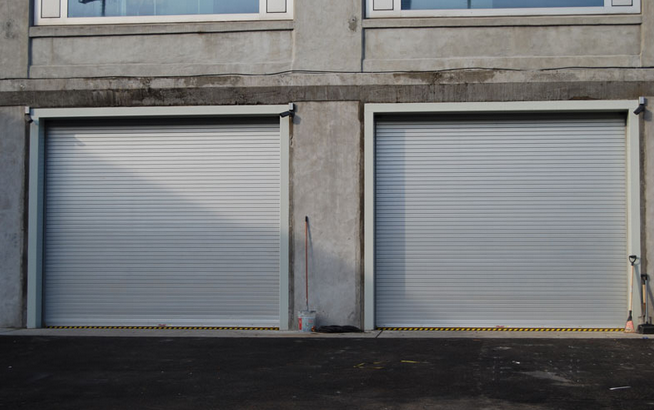 Manhattan rolling steel doors require almost no maintenance and are easily replaceable, only adding to their reliability and cost-effectiveness. Very Customizable. Manhattan rolling steel doors are available in a wide variety of sizes, styles and colors. In addition, manufacturing improvements and advances in coating and paint products enables customization to suit even the most unique aesthetic requirements. 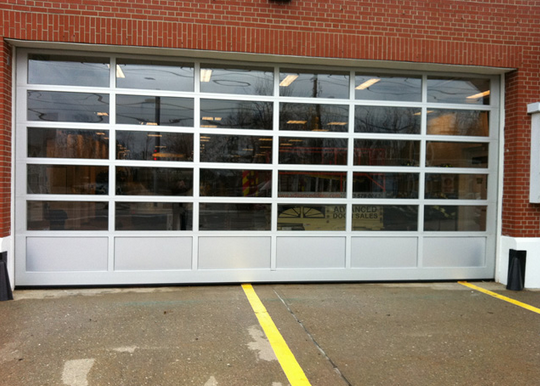 Looking for Quality Manhattan Rolling Steel Doors? Advanced Door has been family owned and operated since 1998. They began in a small garage with just 1 employee and have grown to a 2400 square foot office/warehouse with a separate offsite 30,000 square foot fabrication facility. They provide the finest products and services in the overhead garage door industry, and are “The Professional Garage Door Company”. They are dedicated to serving their customer’s needs, and their goal is 100% customer satisfaction. Advanced Door strives to bring you the best in quality service. If you have any questions or want more information on their Manhattan overhead garage doors and services, you can give them a call at (973)579-0043 or visit the website. Thermal Properties. One of the biggest advantages of installing Manhattan aluminum & glass garage doors is the energy efficiency they offer. The glass panels of these garage doors are available in a wide variety of insulation choices and high R-value ratings, which help to keep heating and cooling costs down. Lightweight. Manhattan aluminum & glass garage doors are much lighter than their steel counterparts. If your operations involve the regular opening and closing of the garage doors, then having a lighter door will extend the lifespan of the opening and closing mechanism and torsion spring. With less maintenance required, comes lower operating costs. Another weight benefit is if you ever have to manually open your garage door, an aluminum & glass garage door is much easier to lift. Appealing. A combination of aluminum and glass gives your facility a contemporary look, improving its appearance considerably. If you are looking to achieve a polished look, then Manhattan aluminum & glass garage doors are a good choice. The frame of these doors can either be painted or embossed with texture. Water Resistant. When it comes to choosing overhead garage doors, it is also important to consider the weather they will be exposed to. Aluminum garage doors are non-corrosive, which means they will not rust and will be able to withstand exposure to weather conditions. These aluminum framed Manhattan overhead garage doors are also wind resistant, as they have been designed to meet stringent wind code requirements. 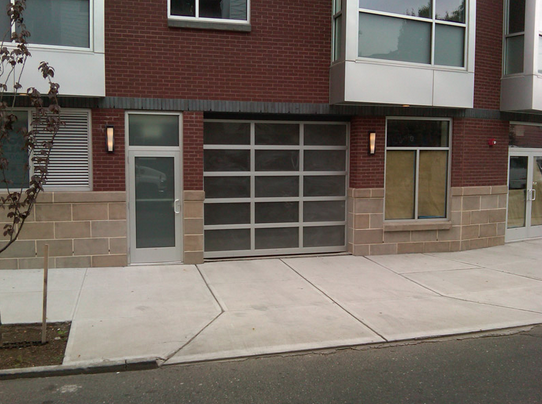 Want Quality Manhattan Aluminum & Glass Garage Doors? Choosing the right Brooklyn overhead garage doors for your home or business can open opportunities to not only make your it more attractive, but also to add security, efficiency and above all, increase market value. If the project is well though out from beginning to end you will be able to come out on top in all of those areas. There are many options and specifications available to choose from, so it is important that you hone on on exactly what you need for the project and keep everything consistent with your goals. To do so, you’ll need to carefully weigh your options of Brooklyn overhead garage doors. Here’s some things to think about to help you choose the best possible Brooklyn overhead garage doors for your home or business. Before you get started with your Brooklyn Overhead garage doors venture, you should decide what you want your garage door to be made of. Garage doors come in various different materials and each one has its pros and cons. Like everything in life, the type of material you choose should be based on your individual needs, goals as well as your location climate. The most common types of garage doors are as follows: Metal, fiberglass, vinyl and wood. Let’s take a look at each one and weigh the benefits of each. Metal doors are typically made using steel or aluminum. Steel or a more affordable and lighter option, aluminum are ideal options if your home will be facing its fair share of inclement weather. If you’re looking for extra security, they’re also ideal options. Steel garage doors are also a popular material because of its durability.f you live in an area where your garage doors are buffeted by high winds, or if you have kids who love to hit baseballs into your garage door, steel doors may be a better option for you. Our carriage roll up garage doors are constructed of the highest quality two inch thick insulated panels.They look great, last forever and are maintenance-free. Steel doors are also very cost effective. They add curb appeal to your home, as well. As a material, fiberglass is a smart choice in particularly cold or particularly hot climates. One of the main benefits is that it can look like wood because of its grains and finish. It’s both durable and a great insulator, which should help with your winter heating bills. Our fiberglass garage doors have all the beauty and appeal of real wood without any of the obvious drawbacks. These doors will not crack, warp or fade like wood, or dent like aluminum. The quality of these doors speaks for itself. With a variety of wood grains and finishes, you can easily customize a door to your taste. If the choice of grains and colors do not offer enough variety, we have a wide selection of window arrangements. The outstanding insulation and weather seal standard with these doors block out street noise, while protecting your garage from the elements. The beauty of wood compliments any exterior of your home, and adds an elegant finishing touch. Although wood is beautiful, particularly for traditional homes, it’s important to keep in mind that wood will require regular maintenance, such as repainting and staining. Some veneers or overlays can offer a similar appearance, at a lower cost. On the plus side, wood garage doors have a natural beauty. They are very versatile and operate silently. Wooden garage doors may be painted, stained and they are available in a great variety of prices, based upon the different kinds of wood; including cedar and mahogany. If you choose a wooden garage door be prepared to spend time maintaining it. You can customize them to your needs and desires. Wood composite garage doors are popular, too. They give the impression of wood but do not require the maintenance needed for actual wood. They price range can run between steel and vinyl garage doors. They come ready to paint with a limited lifetime warranty. Which style will best suit your home or business? The garage door style you choose should reflect the architecture of your home, otherwise it may look like an afterthought. There are so many different styles of Brooklyn overhead garage doors to choose from. There are modern/ contemporary styles as well as more traditional ones. Some styles compliment a certain business or service more than others. How do you choose the right color? Generally, your garage door should compliment, but not overwhelm, your home. That means you should avoid things that are too bright or contrasts that are too extreme. Try to select a color that matches your window trim or will blend in nicely with your siding. Safety and security first. It’s important to hire a professional installer for your garage door because they can be dangerous if installed improperly. Have an expert suggest the appropriate style for your space. You can also choose additional security features for your garage door, such as: a keypad that allows people to enter without a key or handleless doors to ward off thieves. Advanced Door has been family owned and operated since 1998. They began in a small garage with just 1 employee and have grown to a 2400 square foot office/warehouse with a separate offsite 30,000 square foot fabrication facility. They provide the finest products and services in the overhead garage door industry, and are “The Professional Garage Door Company”. They are dedicated to serving their customer’s needs, and their goal is 100% customer satisfaction. Advanced Door strives to bring you the best in quality service. If you have any questions or want more information on their overhead garage doors and services, you can give them a call at (973)579-0043 or visit the website. Manhattan overhead garage doors and overhead garage door services are offered by Advanced Door. They’ve got the knowledge and experience to provide the best job. They are fully capable of servicing any overhead garage door project from the smallest to largest available. This includes both residential and commercial services for Manhattan overhead garage doors. Here are some of the different kinds of services that they can offer you. Springs, cables, pulleys, track, sections and rollers. Preventative maintenance: They can provide a complete preventative maintenance program, and they can perform their maintenance when you are available as to alleviate interference with your operations. They can identify problems prior to a complete breakdown. Looking for the Best Company for Manhattan Overhead Garage Doors & Services?